Fast Blog Finder v3.0 has a new engine which recognizes new blog platforms and finds much more DoFollow blogs than the previous version. When developing the v3.0 we spent many hours for manually verifying hundreds of blogs to ensure that the program determined the blog type correctly. Despite this, we don’t expect the program to be 100% accurate in analyzing the blogs. So, we added the "Report Wrong Blog Type" option to the program. Using this option you can send us the URL of the blog that was determined incorrectly by Fast Blog Finder. We'll check it out and make improvements in the program engine. When a new version of the checking engine is available, Fast Blog Finder will download it automatically when you open the program. You won't need to re-download and re-install the entire program. Fast Blog Finder will update the checking engine automatically every time a new version of it is available. First of all I decided to test a few free blog commenting programs but they appeared to be not very usable. The principle "You got what you paid for" works here perfectly. And what about paid blog commenting software? I purchased a blog commenting program from our closest competitor. I took the keyword phrase “home business” and ran a search for the blogs in the competitor’s program. I started checking DoFollow blogs manually. 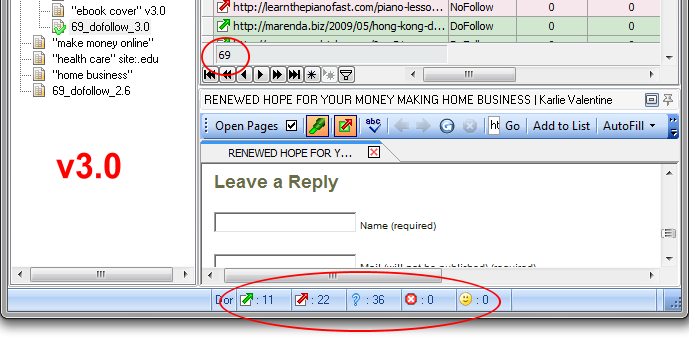 The manual check of 69 DoFollow blogs showed: 11 – DoFollow, 22 – NoFollow and 36 – Unknown. Now I decided to check those 69 blogs with Fast Blog Finder. I exported 69 blogs to a file, imported them into Fast Blog Finder v2.6 and ran the “Detect Type” option. As you see the old 2.6 version gave the same results as the manual check. Now let's check 69 DoFollow blogs in the new 3.0 version. The results are still the same in the v3.0. Then I loaded NoFollow blogs found by the competitor's program into Fast Blog Finder v3.0 and scanned them. From 626 NoFollow blogs 31 turned out to be DoFollow, 539 – NoFollow and 56 – Unknown. And what about Unknown blogs found by the competitor's tool? After scanning 659 Unknown blogs with Fast Blog Finder v3.0 I got: 17 – DoFollow, 302 – NoFollow and 340 – Unknown. Now I decided to run a search for the "home business" keyword phrase in the new 3.0 version of Fast Blog Finder and compare the results to the results from the competitor's tool. Now I’d love to hear your comments and thoughts. Leave me a comment below and let’s discuss.